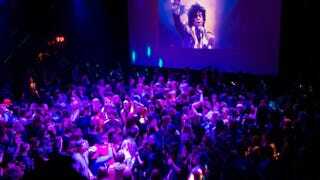 Guests dance to Prince music as a slideshow flashes images of the artist above the stage during a memorial dance party at the First Avenue nightclub April 21, 2016, in Minneapolis. Prince, 57, was pronounced dead April 21 shortly after being found unresponsive at Paisley Park Studios in Chanhassen, Minn., near Minneapolis. There comes a time when mourning turns into celebrating, and that’s exactly what happened Thursday night on Broadway, and in many cities across the U.S. The cast of The Color Purple paid tribute to Prince with a tear-jerking performance of “Purple Rain” led by Jennifer Hudson. I seriously doubt there was a dry eye in the house. Hamilton creator Lin-Manuel Miranda said the show’s musical director, Alex Lacamoire, spent the whole day putting it together. It’s amazing what people can pull off with little notice. When Spike Lee says to come to a dance party honoring Prince, you better come prepared to party. Lee held a Prince party Thursday night at 40 Acres & a Mule in Brooklyn, N.Y., and it looked amazing. Hundreds of people showed up and danced their hearts out to various songs by Prince. But there were probably no gatherings larger than the ones held in and around Minneapolis. Which is fitting, because that’s where Prince got his start. The city showed its hometown musical hero love, the way no one else could: an all-night dance party held at First Avenue, where Prince filmed Purple Rain. It’s still hard to believe Prince is gone, but just like Michael and Whitney, he left a legacy of music that will outlive all of us.